LITTLE ROCK – Two upcoming production meetings aim to help growers and industry experts reach a consensus on the best approach to an increasingly popular method of agriculture in Arkansas: furrow irrigated rice, also known as row rice. “Row rice is an emerging production practice for rice that is increasing adoption, but lacks a consensus on production practices,” said Chris Henry, associate professor and extension water management engineer with the University of Arkansas System Division of Agriculture. The Division of Agriculture has partnered with RiceTec to hold the Row Rice Roundtables, a series of panel-based meetings for farmers to share their experiences with row rice. The meetings are scheduled for Monday, Feb. 25 in Stuttgart, and Tuesday, Feb. 26 in Jonesboro. The goal of each meeting is to share knowledge on row rice production practices, Henry said. Audience members are encouraged to share information about what practices are being applied, such as irrigation, fertility, weed management and tillage. The panels will include a mixture of Division of Agriculture experts and industry consultants. In the mid-south irrigation survey in 2015 Arkansas rice farmers reported as many acres of furrow irrigated rice as zero grade rice. “Farmers are interested in furrow irrigated rice because of the potential to reduce tillage passes, plant earlier and explore the use of no-till and cover crops, Henry said. 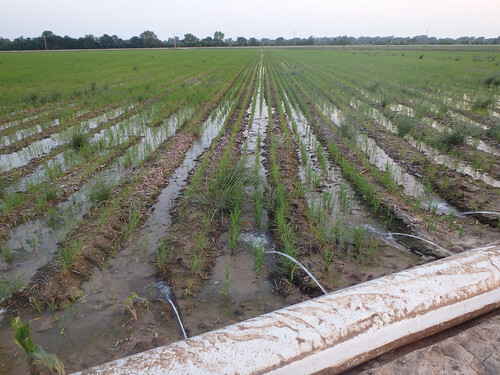 In a recent three-year study, funded by the Arkansas Rice Research and Promotion Board, Henry found that row rice used significantly less water than flooded rice using polypipe or multiple inlet rice irrigation and the yields were not significantly different. “That really surprised us, because we expected higher water use numbers and less yield,” he said. “By sharing experiences, we hope to gather information that can be used to improve recommendations and direct research efforts and it’s an opportunity to learn from other farmers and consultants from across the region,” Henry said. Farmers and consultants with interest in learning more about furrow irrigated rice are encouraged to attend. The roundtable workshops will be from 8 am to noon on February 25 at the Rice Research and Extension Center located at 2900 Hwy 130 E, Stuttgart, and at the Food Bank of Northeast Arkansas at 3414 One Place in Jonesboro. Speakers include Lee Atwill, extension associate, Missouri State University; Marc Cummings, crop consultant; Joe Massey, research agronomist, USDA Agricultural Research Service; Ranjit Mane, assistant professor of agricultural economics, University of Arkansas at Pine Bluff; Ryan Sullivan, Floreden Farms; Brad Watkins, professor of agricultural economics, University of Arkansas; Rob Dedman, crop consultant; Bob Scott, director of the Rice Research and Extension Center; Wendel Minson, crop consultant; Tom Barber, extension weed scientist; Jarred Hardke, extension rice agronomist; Trent Roberts, associate professor of soil fertility; Nick Bateman, assistant professor entomology; and Yeshi Wamishi, extension plant pathologist. The Row Rice Roundtables are sponsored by Ricetec. Attendance is free, and lunch will be provided. To register, contact Kim Jackson at 870-673-2661. To learn about rice production in Arkansas, contact your local Cooperative Extension Service agent or visit the Rice Research and Extension Center online at http://bit.ly/2T1jpRD. Follow the Division of Agriculture on Twitter at @UAEX_edu.